Auckland is a city steeped in rich history, fine dining, natural wonders and picturesque landscapes offering unprecedented outdoor adventures. Although sometimes overlooked for the more rugged and rustic parts of New Zealand, Auckland is making a name for itself as one of the region’s hottest travel destinations. Discover the 10 best things to do during your time in Auckland, and make your holiday a truly unforgettable one. Standing at 328 metres high, SkyTower isn’t just the tallest building in Auckland, it’s also the largest in the Southern Hemisphere. However, the 40 second elevator ride to the observation deck is well worth any potential dizzy spells as it offers arguably the best 360-degree view of Auckland city for 80 kilometres in every direction. We recommend visiting at sunset and staying for a cocktail at Sky Lounge Cafe and Bar. Although, thrill seekers can embark on a SkyWalk along the perimeter of the observation deck, or SkyJump 192 metres to the ground at 85 kilometres an hour. SkyTower, Auckland, New Zealand. Image Credit: Brian / CC by 2.0. Cornwall Park is Auckland’s answer to New York’s Central Park and heading there for a leisurely walk is one of the best free activities Auckland has on offer. The park lies on one of Auckland’s iconic volcanoes, Maungakiekie (One Tree Hill), which erupted 67,000 years ago. Now it is home to more than 8,000 trees, 32,000 annual plants, off-road trails for running or walking, open-lawns, barbeque areas, incredible views of the city and a large urban farm. The park is also home to Auckland’s oldest surviving wooden building, Acacia Cottage. Cornwall Park, Auckland, New Zealand. Image Credit: Cornwall Park. Just a short drive from central Auckland, Auckland Zoo is home to 126 different species and more than 1,000 animals from across New Zealand and the globe. First opened in 1922, the zoological park has welcomed more than 28 million visitors since its inception and hosts a full calendar of events and experiences, including keep talks, photography workshops, behind the scenes tours and overnight safaris. A fun day out for all ages, a visit to the zoo is a great way to encounter some of the country’s unique species. Auckland Zoo, Auckland, New Zealand. Image Credit: Auckland Zoo. Auckland’s volcanoes – or mauga – hold significant historical, spiritual and cultural meaning to the Māori people. There are 48 volcanic cones to climb and explore in Auckland, each offering breathtaking 360-degree views. Mount Eden is the highest on the mainland and, at 196 metres tall, it boasts a stunning view of the city and Waitemata Harbour. Take the 25-minute ferry ride to Rangitoto Island and travel through the lava crops and New Zealand’s largest pohutukawa forest to the 260 metre high summit that has inspired countless photographers, travellers and artists. Mount Eden, Auckland, New Zealand. Image Credit: Francisco Anzola / CC by 2.0. 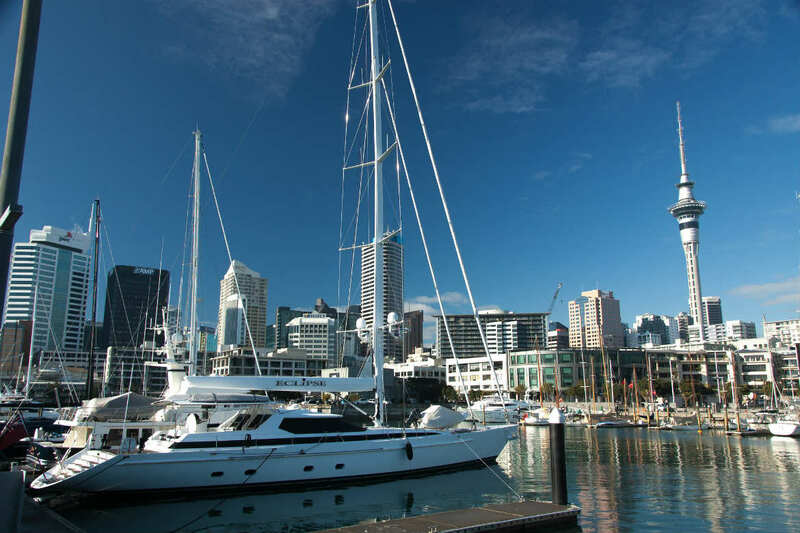 Lined with more than 30 different restaurants and bars, Viaduct Harbour, situated in central Auckland, is the perfect place to head for a meal or drink with a view. Converted from a commercial harbour in the late 1990s, the waterfront spot serves up a variety of cuisines, from Italian and Japanese through to Filipino fare. Choose a venue that matches your tastes and budget, meet up with friends and enjoy an afternoon in Auckland overlooking the water. Viaduct Harbour, Auckland, New Zealand. Image Credit: Viaduct Harbour. Set within one of Auckland’s most iconic buildings, the Auckland Museum (also known as the Auckland War Memorial Museum Tāmaki Paenga Hira) is considered to be one of the country’s most important museums, showcasing collections focused on New Zealand’s natural, cultural and military history. Boasting the world’s largest and most significant collections of Māori treasures (taonga) and hosting daily Māori cultural performances, the museum provides a great opportunity to get to know what makes the local culture so unique. Auckland Museum, Auckland, New Zealand. Image Credit: yashima / CC by SA 2.0. The Auckland Art Gallery is a stand-out aesthetically, in a city primed with beautiful architecture. It also holds more than 15,000 works of art and entry is free, so visitors should not leave until they have immersed themselves in this rich arts and culture hub. The gallery features an ever-changing roster of both local and international artists and exhibitions and often hosts events. Auckland Art Gallery, Auckland, New Zealand. Image Credit: Auckland Art Gallery. Just a 35-45-minute ferry ride from Princess Wharf in central Auckland lies Waiheke Island, the most popular of all Auckland’s Hauraki Gulf Islands. Only 8,000 people call the island home and it boasts a vibrant array of activities for visitors, including walking, hiking, shopping, dining, wine tasting and art gallery viewing. History buffs will not be disappointed as the island is also home to Stony Batter Historic Reserve, which encompasses an underground tunnel system carved out in World War II to protect Auckland in the event of an attack. Waiheke Island, New Zealand. Image Credit: Brian Lamb / CC by 2.0. Auckland is known for having some of the most exquisite landscapes and natural wonders in the world, but it also has a reputation for having some of the best beaches. From the city’s eastern coast to its untamed west, there are more than enough options to cater for even the most discerning of beach lovers. Spend time sun-bathing at Mildford and Chelternham Beaches, which are usually fairly quiet, or enjoying a swim in the calm waters at Maraetai Beach. More adventurous travellers can explore the caves and swim between the flags at Piha, Cornwallis, Huia or Karekare. Maraetai Beach, Auckland, New Zealand. Image Credit: russellstreet / CC by SA 2.0. Before leaving, don’t forget to visit Auckland’s two, most spectacular waterfalls. The first, Oakley Creek Falls, can be found in the waterview section of Oakley Creek (near Auckland central). The second, Mauku Waterfall, is located in Wrights Watergardens. Whilst at Wrights Watergardens, don’t forget to leave time for a leisurely stroll to give yourself an opportunity to absorb the Alice in Wonderland-style ambience. Mauku Waterfall, Wrights Watergardens, Auckland, New Zealand. Image Credit: Wrights Watergardens Cafe, Wedding and Events. Regardless of what you choose to do, Webjet offers the cheap flights, hotels and other travel products needed to make it happen – all on one, easy to use, website. Book your dream holiday today with Webjet New Zealand! Feature Image Credit: Colin Bowern / CC by 2.0.